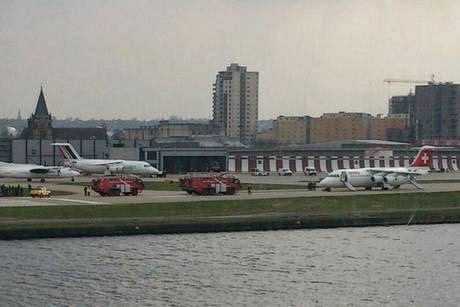 (Press Association) - An engine blew up on an airliner seconds before it was due to leave London City airport, a passenger has said. Four people needed treatment for minor injuries after Geneva-bound LX437 with 74 passengers and four crew on board suffered an engine problem, airport authorities said. Mike Mompi, 28, who was flying to Switzerland for a skiing holiday, said the Swiss International Airlines Avro RJ100 was revving up on the runway for take-off when it happened. He said: "There was a large bang and flames which grew and grew and large chunks of what looked like chunks of red-hot metal started flying up. People started freaking out." He added: "In about 20 seconds we would have been in the air." The runway at the east London airport was closed for more than an hour after the incident at 3pm on Thursday. Mompi, who is originally from California but lives in Shoreditch, east London, said there had been "a bit of a panic" before the captain ordered everyone to evacuate. He said he didn't think anyone had been injured by the engine, but thought it was more likely they were hurt trying to get off the aircraft. Swiss International confirmed that the RJ100 aircraft suffered an engine problem and the pilot aborted take-off. A spokeswoman said: "The pilot aborted take-off at low speed due to an engine problem. Passengers and crew have been safely evacuated." She added that the company had launched an investigation into the cause of the incident. An LCA spokeswoman said the plane had suffered a technical issue and three people were treated at the scene for minor injuries by the London ambulance service. The runway reopened at 4.15pm but passengers were warned they faced disruption. It is not the first incident to feature an RJ100 at the airport. In February 2009, a British Airways flight from Amsterdam crash-landed when one of its wheels failed. The 67 passengers and four crew on the flight were evacuated and paramedics treated four people for minor injuries. The aircraft derives from the old British Aerospace 146, which effectively "made" London City airport. When the hub in Docklands opened in 1987, the BAe 146 was for a time the only aircraft able to use the airport.